Anyone who enjoys the art of trolling crankbaits and other fishing hardware has undoubtedly asked themselves…. “How deep are my lures running?” Knowing where your gear is in the water column means everything to a troller who otherwise is fishing blind and literally hoping to blunder into fish. Enter Precision Trolling stage left. The premise of Precision Trolling is simple. Understanding that certain variables (primarily lead length, line diameter and trolling speed) control the diving depth of crankbaits and other fishing hardware becomes a powerful tool. As a fishing tool, Precision Trolling allows anglers to accurately predict the running depth of their favorite lures and diving devices by simply monitoring the “variables” and then consulting the coveted Precision Trolling Data Dive Curve Charts for specific depth information. The Dive Curve charts produced by PTD are simple to read XY graphs that show the “feed down” a lure is achieving along the left margin and the “feet back” needed to achieve respective depths along the bottom margin. These Dive Curves shows at a glance the running depth of any lure or device based on a pre-determined lead length, line diameter and trolling speed. With the help of the Precision Trolling Dive Curves, an angler can literally aim lures at target depths or fish marks on the sonar screen. Fundamentally, Precision Trolling as a fishing tool is invaluable from the perspective it saves time and avoids the otherwise “trial and error” process associated with patterning fish on a particular lure and at a specific depth. For most lures and trolling devices two Dive Curves are featured including one on monofilament line and a second Dive Curve on a fused or super braid line. The data published in the Precision Trolling iPhone app and also printed on the Precision Trolling “Stickers” is generated by trolling respective lures and trolling devices past a scuba diver who in turn monitors and documents the “feet down” these devices are achieving on a respective lead length. Each lure or device is tested using multiple lead lengths. The collective information collected become known as “data points” and as these data points are plotted onto the XY graph, the running depth of a respective lure or device becomes displayed as an easy to interpret Dive Curve. The accuracy of the data contained within a respective Dive Curve and how easily that data can be replicated by an angler on the water is astonishing. Currently the Precision Trolling staff is measuring floating/diving style crankbaits to the inch and sinking devices which are highly speed sensitive are measured plus or minus within a six inch window. Access to data this accurate changes the game of fishing from a trial and error pastime into a science. 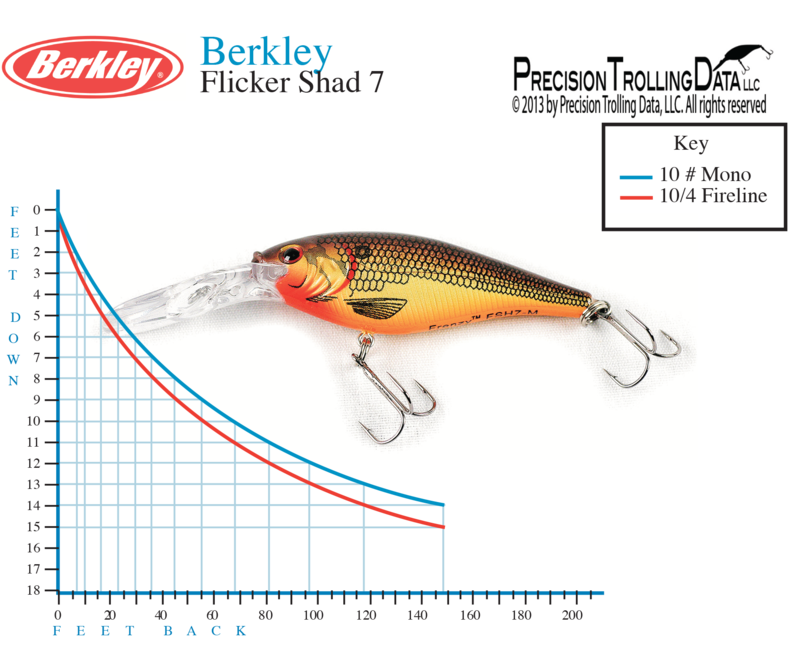 The science of Precision Trolling allows anglers to accurately predict the most productive lead lengths and then to replicate them with other lines and lures. Every summer the staff of Precision Trolling collects new data in anticipation of publishing Dive Curves for new lures, adding more critical data to already established Dive Curves and exploring new trolling concepts. As the data points are collected one by one, the picture of what respective lures or devices are doing below the surface slowly takes shape. Often the numbers are predictable and even mundane, but in a few cases the test results yield strikingly different numbers than anticipated. It’s the “surprises” discovered during testing that makes the process of Precision Trolling not only interesting, but in many cases profound fishing discoveries. Highly touted lures like the Berkley Prototype lure, Rapala Scatter Rap series, Storm’s Mad Flash series, the Matzuo Kinchou Minnow, Kinchou Shad and Reef Runner’s new minnow diver are classic examples of crankbaits that capture the attention of anglers who anxiously await the respective Precision Trolling numbers. Never before has Precision Trolling staff tested lures that are more anticipated than the baits mentioned here. Baits like the #BerkleySecret are going to rock our world. This bait hasn’t even been released to the public yet and already Precision Trolling staffer Gary Parsons used the #BerkleySecret to win a major walleye tournament! The Rapala Scatter Rap series also delivers with an unique “hunting” action that intensifies as the trolling speed is increased. The Matzuo Kinchou series features body profiles never before seen in the world of crankbaits and Reef Runner’s new minnow diver combines some of the best features of previous Reef Runner lures with a whole new body shape and action. All these lures and dozens of others will be featured in the Version 2 iPhone app and also on Precision Trolling “Stickers” providing anglers both an electronic and printed version to choose from. Work has already begun on an Android app and in the coming months the much sought after Precision Trolling data will also be available in other venues to be announced. Now that the much anticipated iPhone app for Precision Trolling is available, the staff at Precision Trolling is dedicating itself to doing what it does best, ie: carefully and precisely collecting trolling data and making that data available to avid anglers. Anglers can download the “free” Precision Trolling iPhone app as a sample to see both the “Dive Curve” chart and the “Depth Wheel” in action. To purchase other lures individually is $1.99 or the entire Version 1 collection of Dive Curves can be purchased for $49.99. There is also a “Life Time” purchase option for $99.99 that will allow anglers to download future data at no additional cost for the life of the app. As future Versions are introduced and published, the cost of the Life Time option will increase to reflect the additional amount of data involved. This means that investing in the Life Time option makes the most sense before Version 2 is released. For more information on Precision Trolling go to http://www.thenextbite.tv/Precision_Trolling or pay a visit to the Facebook page. The era of Precision Trolling just hit hyper drive and there is no limit to the amount of fishing data the various forms of Precision Trolling Data, LLC will be sharing with avid anglers.